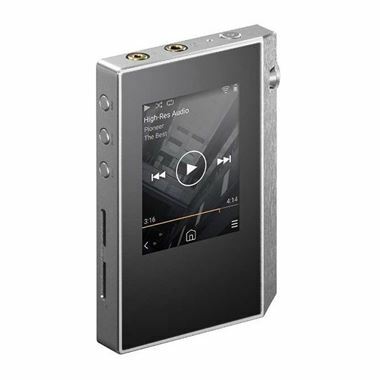 Pioneer XDP-30R Portable Hi-Res Digital Audio Player. Available with Online Finance and Free Delivery. Be at a concert when you’re on the train. Float into space without leaving your desk. With the XDP-30R, jack in your headphones, and you can get inside the sound. Immersing you more thoroughly than many big-dollar stereos, the compact XDP-30R unveils astonishing layers of detail in music, opening up the soundstage, improving instrument separation, and propelling rhythm with irresistible energy. Hear your favorite songs as if for the first time, and get fresh insight on the music you love. Huge storage and a slick interface make this a practical player. There’s Wi-Fi® for on-demand streaming, and twin SABRE DACs and amps offer balanced output. The XDP-30R will satisfy the audiophile, yet it’s also ideal for those curious to hear just how good their headphones can sound. Formerly the domain of desktop headphone setups, balanced output is set free by a 2.5 mm (3/32?) 4-pole jack. You can choose BTL, which boosts driving power, or ACG, a stable mode that results in taut and clearly defined low-frequency sound. ACG enhances overall clarity and spatial dimensionality. Balanced output eliminates crosstalk and improves stereo separation. 16 GB of Internal Memory Storage (Expandable to 416 GB) - N.B. 100GB storage = Approx 270 CDs converted into FLAC (uncompressed lossless) storage.